We were asked to undertake decorations to the newly-restored "walled garden" at Beeston Fields Golf Club – a beautiful, historical building set in acres of parkland in Nottingham and housing a golf course, restaurant, wedding and meeting venue. 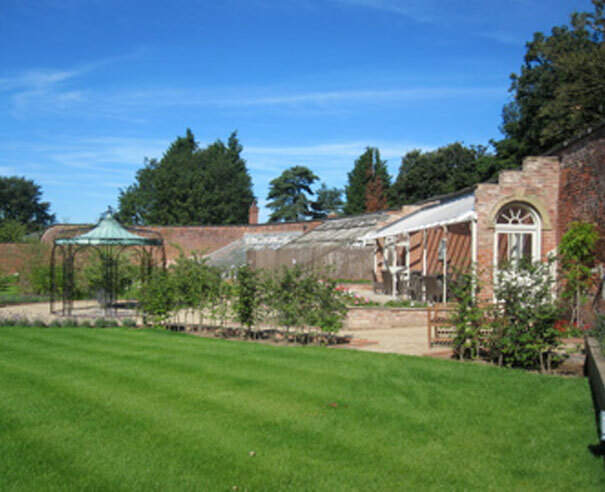 The "walled garden" is fast becoming one of the most stunning wedding venues in Nottinghamshire and our remit was to enhance the old wall and surrounding areas by re-painting the old plastered masonry, but to retain the original brickwork showing though to enhance the aged quality of the Victorian garden. Liaising with our client, a natural stone shade was chosen to compliment the existing rustic colours of the wall and the attached Orangery, with its aged, wrought-ironwork stanchions and timber framework – all of which were re-decorated to provide an effective backdrop to the stunning marquee and bandstand areas of the gardens. We even painted the luxury external toilet cabins to match the colour scheme!